John Galloway was born in Alyth, Perthshire. He was employed as a baker at Lamb's Temperance Hotel in Dundee. He pledged a subscription for £5 towards the Albert Institute, together with his fellow employee, Robert Powell, a waiter there. Subscriber 135 – Thomas Lamb was his employer for a time as the owner of the Temperance Hotel. Subscriber 189 – Robert Powell was a waiter at the Temperance Hotel when John was working there. John Galloway, at the time of his marriage in 1857, was a young man aged 20 years and already declared to have been a 'baker.' In 1851, the census recorded him as having continued with that occupation, although his listing was more precisely titled that of 'pastry baker.' There is no clarity as to where he was employed at that point. However, a few years later, by 1863, at the time of pledging a subscription towards the building of the Albert Institute, there is little doubt that he was in the employ of Thomas Lamb, the proprietor of 'Lamb's Temperance Hotel and Dining Rooms (this according to the 'Subscribers' List). It would seem that he may have been an employee for a further number of years, as it would not be until 1874 that his first listing in the Dundee Directory appeared, operating on his own account at 50 Polepark Road. A newspaper article indicated that he operated a bakery a little before this date. John Galloway was born in Alyth, Perthshire circa 1837. At the time of the 1841 census, he was living with his mother, Isabella McCallum, in Morn Street, Alyth, aged 3 years approximately. The Galloways had moved to Dundee by 1851 and he lived there, at various addresses, for the rest of his life. In 1857, John Galloway married Jessie Small and the marriage certificate identified his father as James Galloway, a joiner. John’s occupation was listed as having been a baker. John and Jessie had nine children, 6 daughters and 3 sons. Their son Alexander, born in 1866, had the middle name of ‘Lamb,’ perhaps out of respect for his then employer, ‘Thomas Lamb,’ the owner of the Temperance Hotel at 56 Reform Street. Not all would appear to have been plain sailing for Galloway however. 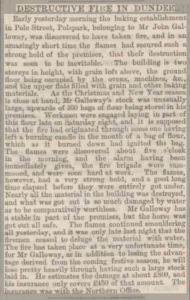 In 1873, the ‘Dundee Courier’ reported that John Galloway had sustained a large fire at his premises at Polepark, losing a particularly large stock, it being being ready for the festive season. Over the following 25 years, John Galloway operated at various locations in Dundee as a baker/confectioner. It was not until 1900 that John Galloway, by then in his 60s, had a change of employment. His listing was that of a ‘timekeeper.’ By 1901, the census expanded the description to indicate that he had become a timekeeper on the tramways of Dundee. Statutory Registers. Lochee. Dundee. Marriages. (1857). 282/ 3 26. Scotlandspeople website. Statutory Registers. Dundee. Deaths. (1910). 282/ 2 580. Scotlandspeople website. Census Records. Dundee. (1861). 282/1 19/4. Scotlandspeople website. Census Records. Alyth. (1841). 328/7 19. Scotlandspeople website. Census Records. Dundee. (1851). 282/ 42 15. Scotlandspeople website. Census Records. Dundee. (1871). 282/2 11 17. Scotlandspeople website. Census Records. Dundee. (1881). 282/1 22/1. Scotlandspeople website. Census Records. Dundee. (1891). 282/3 22. Scotlandspeople website. Census Records. Dundee. (1901). 282/3 1 2. Scotlandspeople website. Dundee Postal Directory, 1861-62. p.163. Dundee Central Library, Local Studies. Dundee Evening Telegraph. 23 December 1879. British Newspaper Archive website. Dundee Postal Directory, 1874-75. p.148. Dundee Central Library, Local Studies. Dundee Courier. 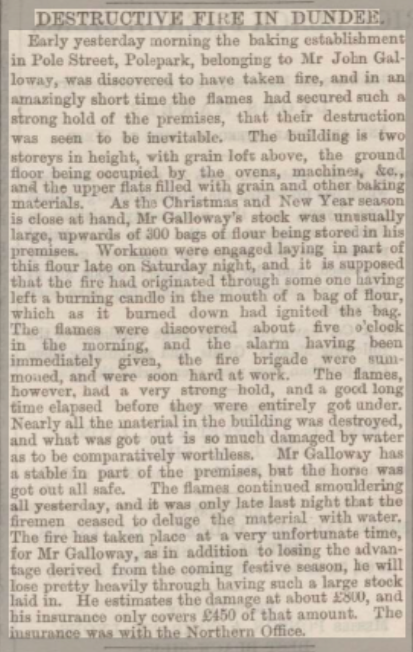 15 December 1873. p.3. Findmypast website. Dundee Postal Directory, 1900-01. p. 249. Dundee Central Library, Local Studies. The information above about John Galloway has been collated from a range of digital and hard copy sources. To the best of our knowledge it is correct but if you are relying on any information from our website for the purpose of your own research we would advise you to follow up the sources to your own satisfaction. If you are aware of an inaccuracy in our text please do not hesitate to notify us through our Contact page.